I think if people were ever inspired by the children’s book ‘The Ugly Duckling’, than the story of the Monarch butterfly must be awe inspiring! Here is a creature that starts life as a little caterpillar, eats and eats and eats until it is about to burst, makes a little sleeping bag to sleep in and then one day emerges with beautiful coloured wings and dances off into the sky! 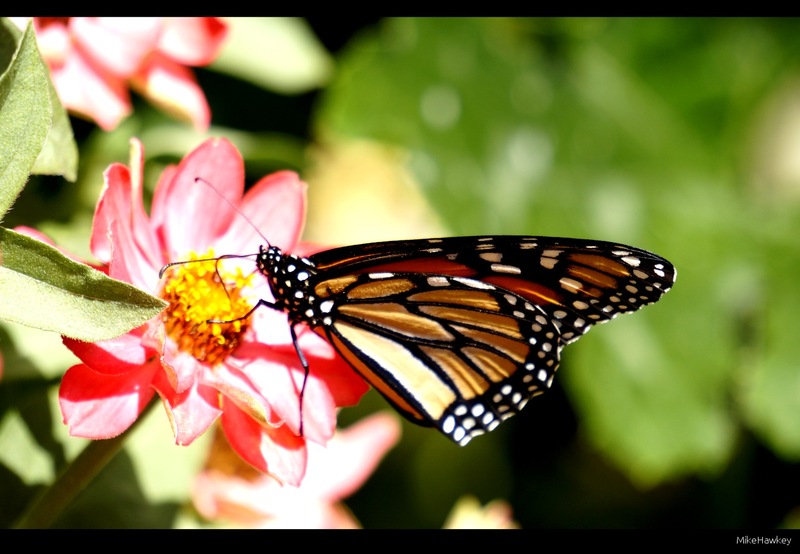 Today’s image, from our back yard, features one such monarch that floated in to sample the local flowers. There was a bit of a breeze out, so watching it come in was a little like planes landing in Wellington on a windy day! As with many creatures in nature, their colour serves to warn off would-be predators like birds, for whom they are poisonous. Surprisingly, reading a little more about them, the monarch butterfly is classed in the near- threatened grouping on a conservation level. We seem to get a good number of them around Auckland at least! Shot on the Sony with 210mm lens (315mm 35mm equivalent) , I bumped up the contrast and sharpness to compensate for the fairly flat image that came out the camera. Wind aside its been a great start to the long weekend, so I will get back to it!